Until the 1960s, Detroit was one of America’s most important cities, a hub of industry with a population of almost two million and a skyline to rival that of any U.S. city. Its buildings were monuments to its success and vitality in the first half of the twentieth century. At the start of the twenty-first century, those same monuments are now ruins: the United Artists Theater, theWhitney Building, the Farwell Building and the once ravishing Michigan Central Station (unused since 1988) today look as if a bomb had dropped on Motor City, leaving behind the ruins of a once great civilization. 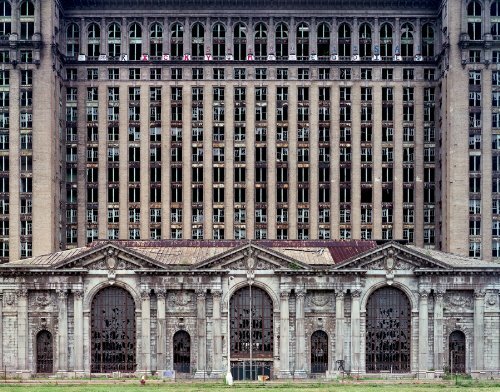 In a series of weekly photographic bulletins for Time magazine called “Detroit’s Beautiful, Horrible Decline,” photographers Yves Marchand and Romain Meffre have been revealing to an astonished America the scale of decay in Detroit.“The state of ruin is essentially a temporary situation that happens at some point, the volatile result of change of era and the fall of empires,”write Marchand and Meffre.“Photography appeared to us as a modest way to keep a little bit of this ephemeral state.” As Detroit’s white middle class continues to abandon the city center for its dispersed suburbs, and its downtown high-rises empty out, these astounding images,which convey both the imperious grandeur of the city’s architecture and its genuinely shocking decline, preserve a moment that warns us all of the transience of great epochs.